Good & Local Friday: We Broke Ground! Happy Friday everyone. Welcome to our Good & Local link up. This is the best day of the week for visiting our blog! Other local food lovers are invited to link up their blog posts to our Friday blog post. What are you growing, are you visiting farmers markets, how are you cooking your seasonal foods? If you live within 150 miles of Story City, IA, we'd love to have you link up how you're enjoying local foods this week. Link up anytime through next Thursday. Click here for more info on Good & Local. Today we broke ground for the Story City Locker. Rain was forecasted, but it was in fact a sunny morning for the groundbreaking. When Ty and I are visiting with others about the locker, more often than not they want to verify with us that we're actually going to process chickens. Yes, we really are! Chicken processors in Iowa are limited. We're looking forward to providing the service, so we designed into the locker plan an area solely devoted to chicken processing. Chicken processing will be part of a schedule that allows us to focus on beef, pork, sheep, goat and game processing as well. But we'll have entire weeks throughout Summer and Fall devoted to chicken processing. In the retail area of the locker, our butchery The Cleaver, we will have chicken for sale year round. We'll source local, free-range poultry when it's seasonal. In the off seasons we'll have regional, organic poultry in the freezer. All of our talk about poultry processing has made me hungry for cooked chicken lately. We're typically pork people, but last night a chicken craving motivated me to purchase a whole organic chicken from the grocery. The roasted lemon chicken paired up perfectly with Ty and my foraging finds this week. Ty found morel mushrooms in our timber for the first time ever! I found my first patch of wild asparagus this week. Ty fried up the mushrooms and I baked an asparagus tart. The tart recipe is on the Cooking Jamie blog. 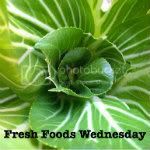 She linked up to the Fresh Foods Wednesday link up on the Gastronomical Sovereignty blog. I love that link up! Do you enjoy foraging as well? What treasures are you finding to cook up deliciousness with this Spring in Central Iowa?